You know what I like about Arby's? Their sandwiches in person look exactly like they do in the pictures. No matter what I try out on the menu, it always tastes great. 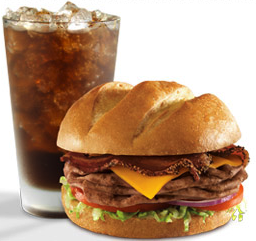 And now Arby's is giving away the OFFICIAL Sandwich of the Summer - for free! It's the BBQ Roast Bacon Cheddar Burger. This offer ends on the 15th of July - don't let this offer go by. This deal is especially good if you're in Los Angeles, San Diego, Long Beach and Irvine.